Spoiled Techie | Google listened to me and put something on their front page! Google listened to me and put something on their front page! 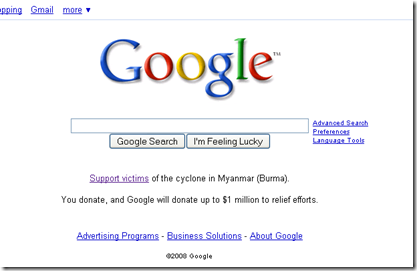 A few days ago, I saw a blog post from the official Google blog that spoke about donating to victims of Myanmar victims. 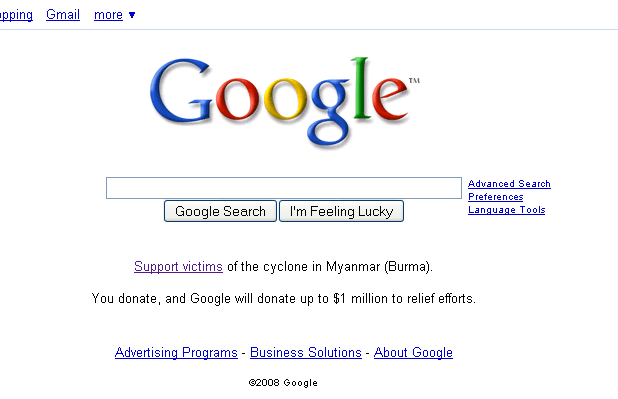 They opened up a Google Checkout to take donations from people to help the victims of the Cyclone that hit Myanmar (Over 40,000 missing and 22,000 dead). I then decided to write them a little love note and tell them that this is awesome to post on their blog. Except for the fact it only reaches 499k Readers (current subscription) who RSS it. I wrote them a little note that said good job, but how about taking one step further? I asked them to post a link on their front page to actually get the mass amount of people who actually visit Google on a daily basis. I was completely surprised and IMPRESSED that when I checked back a few days later, they had the link up on the front page and THEY OFFERED TO MATCH IT up to $1,000,000.00. Boy was I impressed when I saw that. I then ask my self sometimes as a self prescribed Fanboy of Microsoft and Google, why doesn't Microsoft do something like this? Are they just in it to make money? I do know one thing, I will continue to LOVE Google for their charities they give to. Thank you guys for making me a devoted follower! Thanks again Google for making a difference in the world. Now only if you would cycle through those bottom links to include other charities for the good and ALSO started to put it on IGOOGLE for those people that never see it.